These Game Show PowerPoint Games are a FUN activity for you to use to teach and for students to learn with! This game will make any skill something students are EXCITED to do! My class CHEERS when they see this game in the plans. PERFECT for review! 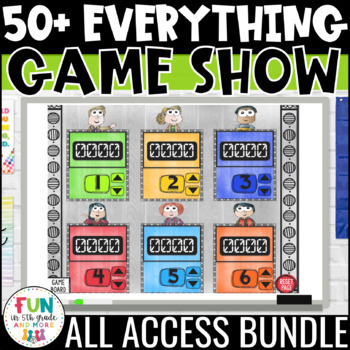 I will continue to add any Game Show I make to this bundle. So buy now to save the most! I have lots more planned soon! ☆Put students in up to 6 groups to play this Jeopardy style game! Review days can be dull and kids just don't always put forth their best effort. But if you tell them that they will play a FUN review game to test their new knowledge, they will make sure to be listening to your every word and working hard to get the point for their team! Watch the Game Show PowerPoint Video to see how it works!! Or test to make sure this game works on your computer by downloading the Sample Game Show Test File! I play this game a little differently. I like to have all students ENGAGED and REVIEWING every question. So, I do this by having them answer every question. One team chooses the category and amount. EVERYONE answers the questions with their groups and records their answer on their whiteboards. The team, whose turn it is, show me their answer and if correct, I award them the points. If incorrect, any team that has the correct answer can go for the steal and get the points for that question. Then the next team gets to choose the category and points.